When I started this blog, my sole purpose was to show people that you CAN heal yourself. Had I continued to see doctors when my liver was sick, I assure you that I would have been gone by now. Medical professionals, who do mean well, are misinformed by an industry that exists solely to do business. If the root cause of your illness is healed, the industry loses business. 100,000 people die every single year from properly prescribed prescription drugs. More people are killed by drugs than motor vehicle accidents. This is an epidemic, and a purposeful one at that. The same people who own the pharmaceutical companies own the toxic food companies… the pesticide companies… and control the AMA. These people suppress natural cures such as The Gerson Therapy, Ozone Therapy, Bioelectrification, Colloidal Silver, High Dose Vitamin C, B17, Essiac Tea, Rife Machine/Parasite Cleansing, Baking Soda, Cannabis Oil, Essential Oils, Hydrogen Peroxide, etc. 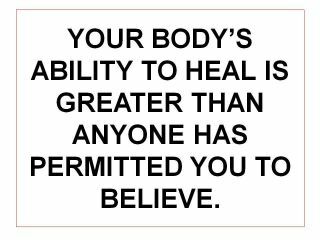 There are so many natural ways to heal yourself, but the medical industry will not publicize them because they are CHEAP compared to the surgeries, life-long pharmaceuticals and chemo that they push. The truth is always simple and affordable – remember that. It may take a while to find that truth, as you’ll see below in Michelle’s story and as you may have read in my story. It has taken me the last 4 years of non-stop research to really understand the body and the root of disease. I spend 8 hours of my day glued to a book or to CureZone.org, sifting through old forums picking up nuggets of knowledge from herbalists and self-taught individuals. You have to connect the dots and figure out what is right for your body. But once you do, the results will be so much more than any pharmaceutical pill could ever give you. So I’ll say it again – you CAN heal yourself, and I hope Michelle’s story serves as the inspiration to do so. Hi Everyone! I want to thank the beautiful and brilliant Olivia for the opportunity to guest blog, it truly is an honor to be part of opening people’s eyes to the TRUTH! As a guest here, I wanted to start off with simple information and work my way up to mind blowing. However, I woke up this morning realizing that my story is important to share – ASAP. I know there are thousands of people like me, struggling just to live everyday. My name is Michelle and I am 37 years old. Most importantly, I am a wife to the most supportive man in the universe and am a mom to 2 amazing girls. My story begins when my daughter, Brooklyn, was born 19 years ago. She was born extremely premature weighing only 1 lb 13 oz, and I was just a kid at the time myself. The doctors told me I would have a miscarriage my entire pregnancy, so I was just waiting on bed rest, sick and heartbroken. It was my senior year of high school. Even though I was young, I wanted her to live more than anything. She arrived at 24 weeks, so tiny and frail… and after 3 months of fighting, she came home! Today, Brooklyn is beautiful, funny and totally knows who she is. She is just amazing. However, what happened to me after she was born baffled over 40 doctors in 5 states, for 19 years. Within weeks of Brooklyn arriving, I started experiencing extreme fatigue and pain in my right shoulder. The symptoms persisted and over the years the spread from head to toe. I couldn’t even wear a ponytail, carry a purse on my shoulder or have a fan blowing on me – I was so sore and always tired! I could sleep for 18 hours a day and not feel rested, and often times I did. I would wake up feeling like I was beat with a baseball bat and beyond exhausted. I would stay awake only long enough to take care of Brooklyn, or take her to school and then go back to sleep. I wasn’t living… I was only existing. The strange part about it all was, I looked great; healthy and perfect as if nothing was wrong. This was good, except for the fact that NO ONE believed me! Family and friends couldn’t understand and eventually I was alone. I went to doctor after doctor and was told that I was depressed and attention seeking, or that it was either fibromyalgia, chronic fatigue, or all in my head. I was given script after script for anti-depressants, pain killers, and muscle relaxants. Nothing for a cure, only to suppress symptoms. I never took any of them even though at that point, they were right – I was extremely depressed. I had a child that I barely had energy to care for, I hurt everywhere and no one believed me. I will save you the long and boring details of the next decade. Eventually, I tapped into my inner strength and decided that if the doctors were not competent enough to figure out why I was so sick, I would figure it out myself. What I learned over the next few years was incredible. I threw myself into research and experimenting with different therapies and treatments, supplements, and diets. I got a job at a health food store to get discounts on supplements and as it turned out, this was my haven for knowledge. The owner of the store would blow my mind daily with new information (Thank you Vicky Larrow!). The more I studied, the more people started popping into my life that would teach me new alternative approaches. The knowledge that I was gaining was unbelievable, and at some point I realized that I was becoming a teacher to many, and helping people heal themselves, too. What was working for others didn’t seem to work for me. I was trying everything that had any indication it would give me relief from the pain. I even tried TMS (transcranial magnetic stimulation), learned biofeedback, and joined a tribe to learn Indian medicine. I ingested and injected things not yet approved by the FDA. I was desperately searching for answers. All along my mind was expanding, but my body was still suffering. No matter what I did, nothing could touch the pain. My body developed hard lumps just beneath the surface – hundreds of them, so painful to the touch. I could feel the pain in every move I made, and it was exhausting. One day I stumbled across a study on mercury, and why amalgam fillings (the silvered colored ones) are poisonous to our bodies. Mercury can attach to almost any cell in the body and create autoimmune diseases in those tissues. Every time someone with these fillings chews or drinks something hot, the poisonous vapors release into their brain. The brain fog at this point in my life was intense: I was forgetting words and feeling like I could no longer hold a conversation. It caused total social anxiety to the point where I would avoid social situations altogether. I was sure that having these filling removed was the answer to ALL of my problems. I spent A LOT of money to have these poisonous fillings removed properly by a holistic dentist. If they are not removed properly, you can end up with even worse mercury poisoning. I had 7 amalgam fillings removed! I went through mercury chelation after this and it was INTENSE! (We will go into greater details about mercury removal/chelation soon.) This was not completely my answer, because the pain was still there along with dozens of other symptoms. I felt hopeless. I continued reading and studying and one day found a documentary called ‘Under Our Skin’ (see below). From the opening credits until the end, I was stunned and crying. The people in the film were me! They had been walking around sick and lifeless; just a shell of a person. I call it ‘dead man walking.’ We are living, only going through the motions. The documentary was about Chronic Lyme Disease. I was convinced this was my answer, and the reason Brooklyn was born so premature. I went to my physician and asked for a Lyme test, and was simply told, “No one around here has Lyme.” Doctor after doctor refused to test me, denying that Lyme was a problem. The fact that I did not present the typical symptom of a bullseye rash meant that I was not a candidate for testing. I was broken and alone, feeling totally defeated. I pulled myself together, and decided that if I couldn’t get the test from a doctor I was going to get to the point where I could order it myself. I became an RN and went on to NP school. Fortunately in the process, doctors had become more hip to Lyme, even though many of them flew under the radar because of the wrath of the CDC. More doctors (in certain areas) were finally willing to order the test. However, I lived in the Midwest at the time and it was not happening there. So, after my daughter graduated from high school, we moved to California! The sunshine and a new perspective was golden for me. I was studying the effects of hormones on the body and knew that there was a correlation between the way I felt and a hormone imbalance. I was convinced of this, because my pain decreased and energy increased when I became pregnant with my second daughter (my cute little Kylie). Turns out, Lyme can wreak havoc on your hormones. I sought out an MD who specialized in bio-identical hormones. I found a doctor that not only believed what I told her, but before I even mentioned Lyme said, “I am ordering you a Lyme test, I believe you have Chronic Lyme Disease.” I broke down in tears! I was at the point where I was so weak, I could barely stand without help and was way too sick for her to treat me. She referred me to an LLMD (Lyme Literate, MD). The test she ordered (IGeneX Western Blot, IGM) came back inconclusive via the CDC standards, because the criteria that you need to meet is very strict. Hundreds of thousands are walking around right now suffering, sick and misdiagnosed, because of this shameless government coverup. Doctors are being sued and shut down because insurance companies do not want to pay for the long, expensive treatment that comes along with the potential years of antibiotics it takes to heal Lyme. It is ignored and brushed under the rug. Doctors are scared to deal with Lyme patients because it could cost them their license. The documentary explains it all. (Back to my test results) – After almost 2 decades of having Lyme, my immune system found ways to hide the disease, making it less detectable when tested (but conclusive by LLMD standards). The damage, however, was undeniable. The Lyme had been ravaging my body for so long that I was having cardiac issues, a resting heart rate of 140, palpitations, and intense chest pain. Neurologically, I developed tingling in my head and face, along with halo vision. I decided to bypass the option of years of antibiotics, now that I knew what I was dealing with, and opted for a holistic MD that specialized in Lyme. This doctor had incredible results with something called a Rife machine. In the early 1900’s, a man name Royal Rife developed a device that produced frequencies. All life vibrates at different frequencies. Rife was able to identify the vibrations of specific parasites, bacterias and viruses and transmit frequencies to destroy them. (There are different theories on how exactly the machine works). Rife claimed he was healing people of cancer with his device. (Side note from Olivia: My friend’s mother cured her breast cancer using this decide to kill specific parasites that were at the root of her illness.) The device is also used on people with AIDS, Asthma, Leukemia, Parkinsons, Stroke, and the list goes on. Still to this day, Rife’s invention is not FDA approved, because it claims to kill pathogens, thus solving problems. In my opinion, the FDA only wants to treat, not solve the problem. The powers at the time saw the potential of this powerful device and started destroying Rife’s credibility and suppressing his work. He eventually died broke and was labeled as a fraud. The doctor that was treating me also had the suspicion that I had an underlying infection in my mouth that may be causing my body not to heal. She was right! I had studied root canals in the past, but my memory was impaired due to damage from the Lyme, and I had no recollection of having two root canals done (Lyme damages teeth as well). I found out how deadly it can be to have a root canal in your mouth. The bacteria in root canals can cause destruction of the nervous system and other systems, resulting in autoimmune reactions. If you currently have a root canal, GET IT OUT! Let go of vanity and know that you are carrying around a dead tooth that is a breeding grounds for bacteria. This bacteria creates devastation to the immune system and eventually causes disease. A researcher and physician named Dr. Robert Jones studied the relationship between breast cancer and root canals and claims that in a 5 year study of 300 women, 93% of the women with breast cancer had a root canal, and the other 7% had other oral issues. The women with tumors, in most of the cases, had the tumor growing on the same side of their body as the root canal. I had the root canals removed immediately, but still remained sick. In Chinese medicine, if you are having issues anywhere in your body they will look at your mouth first. Not surprising, in Western medicine, the mouth is looked at as a last resort! Every tooth is connected to and has a direct influence on each organ, the Chinese call these meridians. The doctor recommended having a holistic dentist do a cavitat scan on my mouth. Cavitat scanners, even though FDA approved, are being looked down upon by mainstream dentistry, because these scans show the damage that root canals are doing to the bone marrow and the infection these dead teeth are producing. Root Canals are a huge money maker for dentists (over 20 million root canals are performed in American every year) and the truth would be a major financial loss for the industry. What my cavitat scan showed was indeed infection, and lots of it! The extreme infection was in the place where the root canals used to reside, and every wisdom tooth I had pulled around the time Brooklyn was born, had deep infection as well. My body was under extreme stress at the time and when the spaces healed, infection remained underneath. This infection is what was leaving my body too weak to heal, no matter what I did right! Ozone therapy is used to rid the body of these covered infections. I was given ozone injections in the infected areas along with ozone in my lungs through nasal cannula, along with in my ears. Underneath each of your teeth are miles of something called tubules. The tubules are small enough to accommodate bacteria, but not big enough to allow white blood cells to enter to fight the bacteria. This is where the infection hides. Ozone therapy, when injected, turns into hydrogen peroxide, and is able to travel throughout these tubules and kill infection. This was a painful treatment, but absolutely necessary to allow my body to finally start the healing process. Thankfully, more and more doctors and dentists are beginning to practice ozone therapy across the country. Looking back on my journey, I’ve realize these struggles were also a blessing. After releasing the victim mentality and stepping back, I am able to see the beauty in it all. The wonderful people I’ve met during this process that have enriched my life. The incredible knowledge I have learned through trial and error, and most importantly the infinite strength I have gained by never giving up, all are invaluable and have made me who I am today. I started out as a student and along the way became a teacher to many, and I am incredibly grateful for all the experiences that have led me to this moment. Disclaimer: The following is a detail of my own personal experiences, it is not meant to diagnose or cure, these are strictly my opinions. Before starting any new treatment please seek the advice of your medical professional. My daughter was diagnosed with lupus bit I’m thinking she may have Lyme. Where can I find a good doctor that will test her? Also where can I purchase cannabis paste? Your story is amazing, thank you for sharing. I believe everything happens for a reason and this blog came at the right time. I do have one question, do you use any particular cbd brand and how much do you take? I feel like I just read my own story…. it is unbelievable. I JUST told my boyfriend today before reading this article that I feel like I am dead and just walking around existing. The pain comes and goes but when it comes now it’s full force. I had a bad day today and felt completely hopeless. Reading that more parasite kits are going to be available gave me a spark to keep pushing. I will be looking up all of the above treatments immediately. Can you explain how the oil works? Does it actually kill the Lyme disease or just help with the pain? Also, can your next post be that of explaining how to make your own oil? Thank you for sharing your story!